Second Life Relay for Life benefit event – July 11, 2009. While Facebook and Twitter are lauded to the skies, neither has found a way to make money – whereas virtual worlds such as World of Warcraft, Entropia Universe, Habbo Hotel, Club Penguin and Second Life are all profitable because their business models are based on the digital elixir of subscriptions and micropayments, according to Victor Keegan (pictured) in the UK Guardian. It’s a formula that other websites, including newspapers, would die for,” he says. 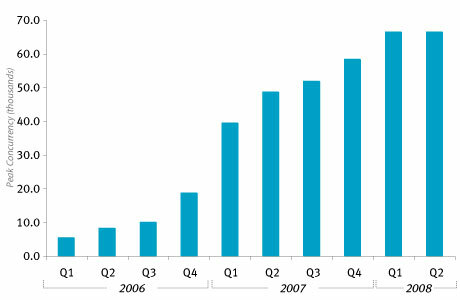 ” Twitter makes the noise, Second Life makes the money … actually, they are booming. In a message which will have the virtual world doomsayers frothing at the mouth Keegan quotes the UK consultancy kzero.co.uk, the world-leader in understanding the marketing dynamics relating to virtual worlds, as reporting that membership of virtual worlds grew by 39 percent in the second quarter of 2009 to an estimated 579 million, although not all are active. “If you think virtual worlds are a passing fad, look at the figures,” Keegan says “Almost all of the 39 percent growth came from children. Girls used to grow up with their dolls; now they are growing up with their avatars. This goes largely unreported because the users don’t read newspapers, but as Kzero reports, poptropica.com – aimed at five- to 10-year-olds – has 76 million registered users. “If you move up to 10- to 15-year-olds, users rival the populations of countries – led by Habbo (135 million), Neopets (54 million), Star Dolls (34 million) and Club Penguin (28 million). Keegan, noting that Second Life is consolidating as it tries to make the experience easier and less crash-prone, says it is still the creative laboratory of the genre even though it may not end up as the preferred platform as new business models take advantage of the rapidly improving technological developments elsewhere. “With technology moving so fast and a whole generation growing up for whom having an avatar is second nature, virtual worlds have nowhere to go but up. “Only they won’t be virtual worlds – just a part of normal life,” he concludes. So you think you know who you are speaking to? Virtual World users will soon be able to have their avatars speak in the voice of their choosing, by typing what they want the avatar to say. This will result from of a “strategic” partnership announced Wednesday between leading Text-to-Speech (TTS) vendo Cepstral LLC, of Pittsburg, PA, USA, and virtual world entrpreneurial pioneerAnshe Chung Studios Ltd. (ACS), today a leading developer and distributor of virtual goods in 3D online environments. The deal will enable Cepstral to distribute the audio into the required virtual world from its hosted (SaaS) platform at VoiceForge.com. VoiceForge currently offers the world’s largest catalog of more than 50 unique English voices, allowing users to choose the personality their avatar speaks with. Voices range from novelty accents like Evil-Genius, Dallas, Top- Hat, Belle, and Vixen to classic young adults, American and British (pictures at right). Initially, ACS will use the technology in the 3D virtual chat environment IMVU, and probably later into such virtual worlds as Second Life, Twinity, SMeet and Entropia Universe. ACS has sold more than 1.2 million pieces of flash-enabled furniture in use in IMVU. Users of that furniture will be able access stre aming TTS immediately. Users who have not purchased furniture from ACS can still demo the VoiceForge TTS service provided they are in a room with flash-enabled ACS furniture. This opens up the TTS service to all 20 million current IMVU users. “Cepstral’s VoiceForge service provides real-time surrogate voices for users,” said Guntram Graef, current CEO of ACS, founded by first virtual world, real-dollar “millionaire,” Anshe Chung (RL: Ailin Graef), and based in Wuhan, China. “Their expansive voice variety is consistent with our mission to provide users with quality digital goods and online personality. Their elegant hosted solution made it a snap to integrate with our products. In looking for a long-term partner, it was also important to us that Cepstral owns all their speech technology (demo) and drives innovation in th e speech technology field,” he said . I find that the voices, although realistic, leave something to be desired when it comes to emphasis, intonation and timing and unable to fully get emotional content across. However, with the right spelling – no typonese – and punctuation they are surprisingly good. The SLENZ project’s “ideal birthing unit” is taking shape quickly with the basic walls constructed on the floor plan and already trialed for ease of avatar use (movement, camera views etc). The trials were done by Aaron Griffiths (SL: Isa Goodman), the Lead Developer for the SLENZ Project, Deborah Davis (Aastra Apfelbaum) of the birthing unit design team and Sarah Stewart (Petal Stransky) (midwifery lead educator). Griffiths, announcing progress on the build, said, “Consideration has been given to the fact that many of the users will be new to the SL environment. Therefore the overall plans have been scaled up to accommodate this in terms of ‘room to move around’. “Doorways have been made wider than they would be normally and the ceiling height extended for the same reason,” he said. “The central corridor, which contacts almost all the rooms has been given semi-transparent walls to allow users to view their surroundings and better orientate themselves, especially on occasions their camera crosses a wall boundary (the “my camera is here but where’s my avatar” syndrome). Believing the basic layout is now satisfactory the team has started to “flesh out” the the detailed physical aspects of the build; cupboarding, mantels, furnishings, shelving etc., and the relationship of each object to the design in terms of its assistance of the birthing process. Although not yet live Meta-Mole.com (http://www.meta-mole.com/Default.aspx), the Meta-Mole, created by the Centre for Design in the Digital Economy (D-LAB) based within the University’s Institute of Digital Innovation, will ultimately be a dedicated searchable online resource for the 350 plus virtual worlds currently existing on the Internet. The Meta-Mole has been designed to help both new and experienced users looking for virtual world environments as well as platform developers who want to gauge competition through providing a searchable directory of available platforms, “easily definable according to the need of the user”, according to Dan Riley, a Metaverse Architect at D-LAB. All data contained within the Meta-Mole will be provided by the platform developers themselves along with official images and videos. The Meta-Mole allows for the sharing and comparing of information and provides access to the latest core, technical and specialist features on current virtual worlds, as well as those in development. The Meta-Mole will initially be released as a Beta version focusing on 3D virtual world platforms. Forterra, Blink 3D and Twinity are among those who have already uploaded their details. Watch out for Virtual World developments at the Uni of Auckland’s, Architecture and Planning School. Judy Cockeram (JudyArx Scribe), a senior design tutor at the school, is doing the ground work for a proposed 100-student virtual world course in and about Architectural Media. He notes that with the slashing of budgets for travel and gabfests, virtual world applications are significantly cheaper than video conferencing, telepresence, and travel, yet represent a more engaging and enjoyable learning medium than Web or audio conferencing and most Web-based learning content. The study is based on a Masie Center Learning Consortium’s (a think-tank focused on enterprise learning and knowledge) exploration of learning use cases in a virtual world through the use of a virtual world sandbox provided by Forterra and using Forterra’s On-Line Interactive Virtual Environment(OLIVETM) software platform. The balance of the white paper describes the use cases for Accenture and ACS Learning Services, the results of their efforts, the lessons learned, and the “recipe for success” going forward for new organisations considering how to convert their interest in virtual worlds to tangible field pilot programs that deliver business results. From the top of my head! 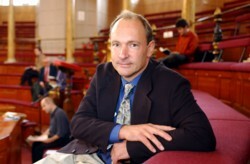 It might be simplistic but it appears to me that Virtual Worlds, although attracting a claimed 160 million users around the world, need someone to recreate something like the virtual world equivalent of Tim Berners-Lee (Pictured -From Wikipedia) and Robert Cailliau’s 1990 WorldWideWeb browser for multi-user virtual environments to really take off. I have an eerie sense of déjà vu when I look at Virtual Worlds today and I think of the time when full text-database retrieval systems were taking off in the early 1980s and the dead-end pre-Web application, Videotex, was being promoted in competition with them. There is no doubt that Videotex, developed to download data within the blanking interval on a television screen, but later used for online share trading and news services among other things, was easy to use with a box and a TV set but no one really had any idea how to make comprehensive text pages attractive and easy-to-use by everyman and woman, until the WorldWideWeb came along. This was despite the fact that scads were spent around the world on travel, conferences, promotions and fact-finding for both online text retrieval and Videotex and other retrieval systems. The WorldWideWeb gave the world the information revolution it needed. It had a graphical user interface (GUI) but it could not display web pages with embedded graphics until the creation of NCSA Mosaic 2.0 by Marc Andreessen and Jamie Zawinski. NCSA Mosaic for Microsoft Windows, the Macintosh, and the Unix X Window System, enabled the average person to use the web. I believe that MUVEs are currently in the same space that the Web was before Berners-Lee created his prototype. Today there is a need for an “universal VW browser and teleportation pad” to make sense of all the worlds and to link them all – or the majority of them – transparently, as Berners-Lee linked the pages on the web. In education MUVEs could provide an enlightening learning environment for distance students but in countries like New Zealand this is problematic because of the lack of a generic VW “browser”, bandwidth problems, inconsistent broadband line speeds that are often little more than dial-up speeds and spurious line speed claims and promotions by the two major ISPs -TelstraClear and Telecom – who have failed to keep up with the rest of the developed world although charging like wounded bulls for bandwidth usage (I believe because of their tardiness similar problems will face those who want to endulge in “cloud” computing in the New Zealand environment). New Zealand’s ability to move into the 21st Century of Virtual Worlds will probably be compromised until either the Kiwi telecommunications providers lift their game – or the Government takes over their game from them – and/or a major part of any Virtual World content is able to be held on the user’s desktop as it currently is on some of the more popular MMORPGs, which already provide a better experience than most online virtual worlds. If trans world teleportation can be mastered one could enter virtual world’s like Second Life or Twinity or Entropia to socialise with the world and then via an inworld teleport point move backwards and forwards between your own inexpensive OpenSim “home” and the VW: it would be a “home” where you could do the same things one does in commercial virtual worlds and it would be home where you could invite guests at little cost. 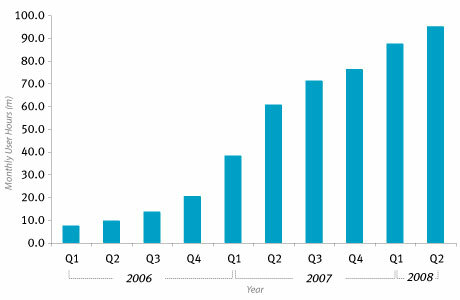 Residents from non-English speaking nations make up almost 40 percent of Second Life’s users, according to the latest metrics made available by Linden Labs (http://secondlife.com/whatis/economy_stats.php). The United States with almost 14 million residents or 40.13 percent, however, still makes up the bulk of residents, with Germany in second place a long way behind with 3.5 million users or 9.99 percent. The United Kingdom has 2.3 million holds thrid place with 6.82 percent ahead of Japan, 6.1 percent, and France, 4.9 percent. Brazil, Canada, Netherlands and Italy each have well over a million users. Australia is still in 11th place with 694,580 users or 2.01 percent. Interestingly males have moved to the forefront of user hours, accounting for almost 60 percent of the time spent in SL. On the age front the over 35s account for 48 percent of the usage hours and the 24-35 age group for almost 35 percent. Although it might not help Kiwi’s frame rates, access speeds or lag problems given the paucity of our overseas internet pipes to Asia it appears we are about to get two Virtual World server farms almost in our backyard. With a virtual Berlin, Twinity already plans to launch a virtual London and Singapore later this year. Metaversum is also working with the government of Singapore on a mirror world project, Co-Space. The US space agency NASA has selected three teams to present proposals for its learning virtual world. The teams being considered are MindArk, presenting Entropia Universe; Saber Astronautics, Nocturnal Entertainment, and Big World; and Project Whitecard and Virtual Heroes, according to Virtual World News (http://www.virtualworldsnews.com/2008/10/nasa-selects-3-proposal-for-learning-virtual-world.html). The teams are scheduled to give live presentations at the Goddard Space Flight Center on November 7. The groups were selected from more than 100 which attended a workshop held in April to discuss needs and opportunities for the virtual world. The project aims to promote STEM (science, technology, engineering, and math) education in colleges and high schools. Citing the longevity and adaptability in addition to the ability to form communities as advantages for an MMO over a simpler educational game, NASA has said the selected team will fund the project internally, working on a licensing model from NASA, which will supply personnel and expertise. VWN quoted MindArk director of special projects, Christian Björkman, as saying “This opportunity to build the NASA MMO is very much in line with our strategy to enhance the learning aspects of the Entropia Universe Platform. It is a perfect way for us to work in collaboration with top academics and scholars to create a stimulating, challenging and educational experience.